The key to designing an authentic Scandinavian interior is the colour ‘white’. A blank foundation facilitated by white floors and walls helps create an atmosphere of spaciousness and serenity. For instance, a floor in a light hue creates an optical illusion of space in rooms with low ceilings. A ‘fresh look’ ambiance is typical to houses in the High North, while the interior still reflects the owners’ personal tastes. One important advantage of choosing light colours as a foundation is that personal mementos and photographs can be generously displayed without creating a cluttered look. White wooden flooring is often the first thing that comes to mind when you picture a Scandinavian interior. The white finishes of Quick-Step Variano timber floorboards such as the Painted White Oak Extra Matt are composed of smaller pieces of wood to create a playful, yet streamlined and light foundation. Streamlined white planks with the convenience and affordability of vinyl – this is what you get in the white finishes of the Quick-Step Livyn Essential Collection such as the Patina Oak Light White and the Painted Oak Light White. The Essential Collection is renowned for its realistic wood look and texture. Being fully water-resistant, this vinyl floor can be laid in wet areas such as bathrooms and kitchens. For those who think bright white is too clinical for their tastes, or alternatively, prefer a warmer hue, natural wood is a great option for creating a Scandinavian ambiance. Natural characteristics such as cracks and knots in the wood produce a lively and cheery ambiance in a contemporary manner. The Quick-Step Chestnut laminate floor was created to perfectly mimic genuine wood. The finish is sustained all the way to the joints and pressed in such a way that the planks have the look and feel of real wood. The Moonlight Oak Light laminate finish also creates a light foundation, but adds a realistic wood print and texture as an extra element. Natural wood options add a little more character to the floor while their light hues will help retain the room’s spacious ambiance. Add splashes of colour to the blank or light-hued foundation with pillows, lamps and designer accessories in vivid hues. Graphic art posters or designer candlesticks with brightly coloured candles are very popular among Scandinavians, and it is precisely these details that make this style so unique and personalised. 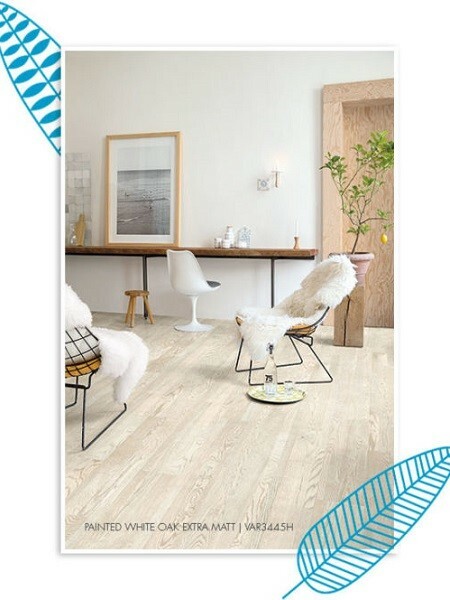 Quick-Step vinyl floors are available from Premium Floors Australia.